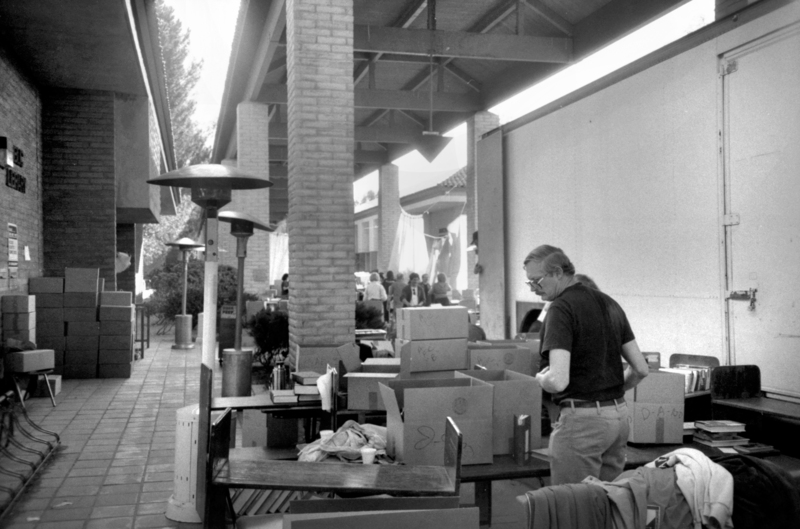 The Valencia Library sustained heavy damage in the Northridge earthquake of Jan. 17, 1994, and a water leak damaged part of the collection, which was moved outdoors for safety. At 4:30 am, on January 17, 1994, residents of the greater Los Angeles area were rudely awakened by the strong shaking of the Northridge earthquake. This was the first earthquake to strike directly under an urban area of the United States since the 1933 Long Beach earthquake. The earthquake occurred on a blind thrust fault, and produced the strongest ground motions ever instrumentally recorded in an urban setting in North America. Damage was wide-spread, sections of major freeways collapsed, parking structures and office buildings collapsed, and numerous apartment buildings suffered irreparable damage. Damage to wood-frame apartment houses was very widespread in the San Fernando Valley and Santa Monica areas, especially to structures with "soft" first floor or lower-level parking garages. The high accelerations, both vertical and horizontal, lifted structures off of their foundations and/or shifted walls laterally. Despite the losses, gains made through earthquake hazard mitigation efforts of the last two decades were obvious. Retrofits of masonry building helped reduce loss of life, hospitals suffered less structural damage than in 1971 San Fernando earthquake, and emergency response was exemplary. The Northridge earthquake proved that preparing for earthquakes CAN greatly reduce the risk. The earthquake brought home several important lessons. When earthquakes occur directly beneath a city, it will be subjected to ground motions with peak accelerations approaching the force of gravity, exceeding the levels of shaking anticipated by building codes. Systems of concealed faults under the Los Angeles area are more complex than previously thought. The significant fracturing of welds in steel frame buildings was unexpected because of the ductility of steel. Understanding the cause and correcting the problem will be essential to continue building in earthquake prone regions. Sixty people were killed, more than 7,000 injured, 20,000 homeless and more than 40,000 buildings damaged in Los Angeles, Ventura, Orange and San Bernardino Counties as a result of the Northridge earthquake of January 17, 1994. Losses were estimated at $20 billion. The earthquake severely tested building codes, earthquake-resistant construction, and emergency preparedness and response procedures. The experience confirmed many of the lessons learned from past earthquakes, exposed weaknesses in the society's generally resilient fabric, and produced many surprises about the levels and consequences of strong ground shaking. Near the epicenter in the San Fernando Valley, well-engineered buildings withstood violent shaking without structural damage. However, numerous structural failures throughout the region were evidence of significant deficiencies in design or construction methods. Steel frames of buildings intended for seismic resistance were cracked, and reinforced concrete columns were crushed. Most highway structures performed well, but freeways collapsed at seven sites, and 170 bridges sustained varying degrees of damage. The Northridge earthquake occurred beneath the San Fernando Valley on a deeply buried blind thrust fault that may be an eastern extension of the Oak Ridge fault system. The fault plane ruptured from a depth of about 17.5 kilometers upward to about 5 kilometers beneath the surface. For 8 seconds following the initial break, the rupture propagated upward and northwestward along the fault plane at a rate of about 3 kilometers per second. Fortuitously, the strongest seismic energy was directed along the fault plane toward sparsely populated areas north of the San Fernando Valley. The earthquake deformed the Earth's crust over an area of 4,000 square kilometers, forcing the land surface upward in the shape of an asymmetric dome. The dome manifests features and consequences of blind thrust faulting that might lead scientists to the discovery of similar faults elsewhere. The lack of clear surface rupture in 1994 may be explained by fault movement terminating at depth against another fault that moved in the 1971 San Fernando event. The earthquake was felt over more than 200,000 square kilometers of the land area of the United States and Mexico and at distances of 400 kilometers from the epicenter. The shaken area and the patterns of damage were broadly similar to those of the 1971 San Fernando earthquake. Differences in damage patterns in 1971 and 1994 were related to the location of fault planes with respect to the ground surface, and to the propagation of energy toward or away from population centers. The earthquake illustrates the concept that earthquakes in general should be thought of as regional events that occur over a brief period of time. The fault rupture moved across an underground surface of about 430 square kilometers in about 8 seconds, producing a wide area of effects at the surface. This concept replaces the widely held understanding that earthquakes occur instantaneously at points and are represented by the location of an epicenter. Geologists continue the search for blind thrust faults throughout southern California by modeling the system of folds and uplifts believed to be produced by slip on these faults. Concurrently, they are mapping the crustal structure of the Earth beneath the region using highly detailed imaging techniques of the Los Angeles Region Seismic Experiment (LARSE). The LARSE is yielding promising results about the tectonic framework that causes earthquakes throughout southern California. In general, the region closest to the earthquake — the northern San Fernando Valley — sustained the greatest amount of damage. There were also isolated pockets of severe damage in Sherman Oaks, Santa Monica, and other distant locations. This damage was related to a variety of local geological and topographic conditions that bear close scrutiny because such conditions are indicators of potential problems in future earthquakes. USGS scientists developed earthquake-shaking indicators (site response factors) for the Los Angeles region that vary depending upon the local geological conditions. Scientists were also able to validate the practice of using data from small aftershocks to predict local site responses to strong ground motions. In addition, scientists developed shear-wave (s-wave) velocity relations that further help determine characteristics of site response in the region. This work shows that damage-prone areas can be defined and assessed for damage-mitigation measures prior to the next major earthquake. One of the highest accelerations ever recorded in an earthquake occurred just south of the epicenter in Tarzana. The 1.78g main-shock acceleration occurred atop a small hill, calling attention to the effects of local topography in amplifying seismic energy. Such effects are reminders that broad seismic-design guidelines, based on interpolated contours of peak accelerations, might greatly underestimate local site conditions. Very deep geological structures affect the amplitude and duration of shaking at the surface of sedimentary basins like the San Fernando Valley. Seismic waves traveling upward from depth are redirected by subtle irregularities in deep geological interfaces, and their energy is focused in certain areas and defocused elsewhere. The waves can be trapped along the edges of the basins, or reflected so that they travel as surface waves across the basins. These effects illustrate some of the reasons for the patterns of damage throughout the San Fernando Valley. Soil-amplification factors at several sites were significantly higher than those specified in the NEHRP (National Earthquake Hazards Reduction Program) Recommended Provisions for nonlinear soil response. Thus, in order to further mitigate future damages, the amplification factors in the Provisions need to be examined and revised in light of findings from the Northridge earthquake. The earthquake produced ground failures of many types at distances up to about 90 kilometers from the epicenter. The nature of these failures provided extremely important information for seismic-hazards evaluations that could not be obtained from studying seismogenic faults alone. Widespread ground failures in the San Fernando Valley typically were underlain by both ground water and fine-grained sediments at depths of less than 10 meters. These associations can be used to identify general areas where studies of ground failure potential are advisable. 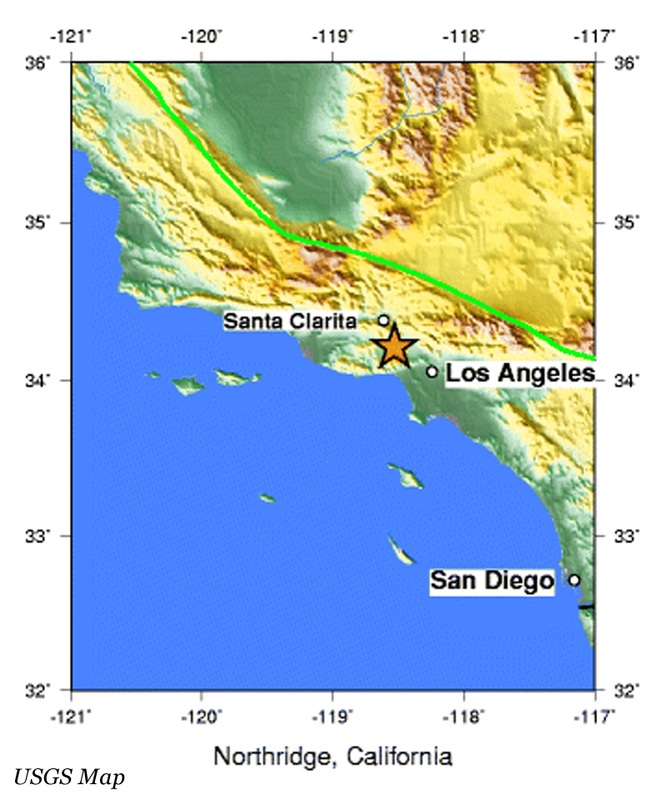 The most extensive belt of ground failures occurred in the Granada Hills-Mission Hills area. There, as at other sites, ground failure was the principal cause of damage to single-family homes and buried utilities. Structures within ground-failure zones suffered nearly three times more damage than nearby structures outside the zones. Foundation damage, which was nearly six times more prevalent in ground-failure zones (and twice as expensive to repair) accounted for most of the additional losses. The most widely distributed ground failures were associated with filled land where poor performance of loose fills caused significant damage to structures. Fills and dams in the Van Norman Complex, reengineered after failures in the 1971 San Fernando earthquake, showed excellent performance under the stronger shaking of the Northridge earthquake. The earthquake caused many thousands of landslides over an area of 10,000 square kilometers, mostly concentrated in sparsely populated areas north of the San Fernando Valley. The landslides destroyed homes, roads, and utility lines, and blocked streams. They also generated dense clouds of dust, precipitating an outbreak of valley fever that caused three fatalities. USGS scientists inventoried the landslides and developed a landslide susceptibility map. The map can be used to produce a variety of scenarios of slope failures during postulated future earthquakes of different magnitudes and locations. Whereas many well-designed buildings and freeway structures performed satisfactorily, there were unexpected failures due to the strong ground motions in the vicinity of the fault rupture. Failures notably included fractured steel frames in more than 100 buildings ostensibly designed for the ground motions produced by the earthquake. Consequently, a program was initiated by a joint venture of structural engineering associations for developing new building codes for steel-frame buildings. Major freeway collapses and damage to more than 170 freeway bridges indicate that, despite a vigorous program of freeway reinforcement since the 1971 San Fernando earthquake, the structures in many places remain vulnerable. Future structural design will need to account for stronger shaking levels than those postulated before the Northridge earthquake. The University of Southern California (USC) Hospital building was the first base-isolated structure to provide data on isolator performance during strong shaking. The isolators proved effective in dissipating the vibrational energy of the earthquake. However, the building was located about 35 kilometers from the epicenter, and ground motions at the site were only moderately strong. The displacements measured for sites nearer the fault would have exceeded the designed displacement range of the isolators. The Olive View Hospital building was built for seismic resistance based on the disastrous fate of its predecessor in the 1971 San Fernando earthquake. The redesigned building performed very well during the Northridge earthquake, probably saving many lives in a region of very intense shaking. However, the design placed the fundamental frequency of the building within a frequency range that produced conditions for resonance, causing concern about performance in a larger earthquake. Additionally, nonstructural failures forced evacuation of the building, indicating a need for interior design improvements in anticipation of future earthquakes. The Holiday Inn in Van Nuys suffered minor damage in the 1971 San Fernando earthquake and major structural damage in the Northridge earthquake. The building vibrations during the Northridge event exceeded the response spectra of both the San Fernando quake and the Uniform Building Code. Engineers also noted a significant amount of torsion in the building response. The collapsed I-5/SH-14 interchange between San Fernando and Newhall was one of the most spectacular and costliest freeway failures. Scientists determined that peak spectral amplitudes at the bridge during the main shock were three to four times the design spectra for periods less than 1 second. Ground motions at the base of the bridge were effectively transferred to the deck where their amplifications resulted in the collapse. Studies of more than 250 ground-motion records showed that peak accelerations during the earthquake generally exceeded those predicted. At several locations, horizontal peaks were close to or exceeded 1g, and at one station, vertical acceleration exceeded 1g. Ground motions both near and far from the fault contained consistent, high-energy pulses of relatively long duration. Midrise to high-rise steel structures designed for lesser motions are particularly vulnerable to these pulses. In general, the ratio of horizontal to vertical shaking was similar to that of past earthquakes, and the motions, although strong, were not unusual. For such shaking, buildings need higher strength and larger ductility to accommodate the motions without damage. The magnitudes of response spectra for both soil and rock sites exceeded critical parts of the Uniform Building Code spectra. Sites such as those in Newhall and Tarzana that experienced unusually high accelerations bear further consideration for special designs to withstand such accelerations. The USGS developed a new shaking-intensity estimator (called the tagging intensity) that allowed analysis of the relative vulnerability of several categories of residential structures. Post-1940 single-family dwellings constituted both the largest building category and the strongest in terms of resistance to damage. Post-1940 multi-family dwellings proved to be more susceptible to shaking damages than masonry buildings or pre-1940 single-family and 2-to-4-family wood-frame dwellings. The data for Los Angeles County yielded the most detailed estimates of damage and shaking intensity ever obtained for an earthquake in the United States. The Los Angeles City program to retrofit unreinforced masonry (URM) buildings was one of the real successes of earthquake preparedness. Many of the several thousand buildings retrofitted since 1982 were strongly shaken by the Northridge earthquake, and most survived without the total collapse previously expected for such structures. The URM and other pre-event mitigation programs demonstrate the success of hazards-mitigation measures and validate market incentives for employing the measures. The USGS constructed new seismic- hazards maps for the southern California region using information from the Northridge earthquake and accounting for the presence of blind thrust faults. For the region, the San Bernardino area continues to be the highest hazard zone based on its proximity to both the San Andreas and San Jacinto faults. Including blind thrust faults tends to raise the seismic hazard by about 15% for areas near the faults. Differences between maps produced before and after the Northridge earthquake are notable in the area of central Los Angeles where probabilistic accelerations increase from 38%g to 45%g with the inclusion of blind thrust faults. Geologic studies at Potrero Canyon exposed evidence of two other earthquakes that likely occurred on buried thrust faults within the past 1,300 years. Part of the Sierra Madre fault — the source of the 1971 San Fernando earthquake — was investigated independently, and geologists determined that only two earthquakes (including the 1971 event) occurred on this segment in the past 3,500-4,000 years. Neither of these, nor earthquakes farther north on the San Andreas fault, produced evidence of their shaking at the Potrero Canyon site. Thus, the geological conditions at Potrero Canyon and similar sites offer promise for determining the frequency of earthquakes from blind thrust faults in the region. Additional evidence from the geological investigations suggests that M = 6.5-7.0 events are perhaps characteristic of thrust-fault structures. USGS scientists developed a method for estimating the levels of shaking that future earthquakes will produce. The method provides realistic, broadband ground motions that represent the range and variability of ground motions from the Northridge earthquake as well as earthquakes postulated for other faults in the region. The method allows real or synthesized strong-motion data to be extrapolated over an area of about 3,600 square kilometers of southern California. An investigator using the method can interpolate within this area to estimate, for example, alternative engineering-design characteristics for a given site. In the aftermath of the 1971 San Fernando earthquake, the new Los Angeles Dam was designed to withstand shaking about three times stronger than that previously assumed. When the dam was tested by the Northridge earthquake, it showed only minor deformation and superficial cracking compared to its predecessor that nearly failed catastrophically in 1971. This success story helps validate the need to build critical structures more resistant to the violent shaking now recognized to accompany large earthquakes. This report is part of a new multimedia approach for reporting USGS findings. The approach takes advantage of World Wide Web (WWW) technology to allow for a variety of views and levels of detail to be expressed to a broad spectrum of information users. A WWW tour of the Northridge earthquake investigations and findings is based on this report, and designed as a "living" entity that is updated as new information becomes available. The USGS and Caltech have substantially improved seismic recording and reporting in southern California, and are now using the system for many applications beyond research. Notably, the system can now be used for estimating the extent of damage from an earthquake within a few minutes of detection of shaking, and reporting this information to all public and private organizations that engage in rapid response. The shaking-intensity map produced shortly after the earthquake was the first use of such a map to help focus relief efforts during a disaster. The seismic recording system also has promise for use in early warning of strong shaking, perhaps providing precious seconds of response time prior to the arrival of the strongest seismic waves. The USGS and several collaborators are rapidly upgrading a prototype Global Positioning System (GPS) array throughout southern California. This system provides a new baseline for studying compression of the Earth's crust by continuously measuring small displacements that may be indicators of stress accumulation on blind-thrust faults. In addition to its scientific documents, the USGS and its cooperators produced many specialty products to communicate findings about the Northridge earthquake. These included magazines, fact sheets, and a personal handbook for earthquake safety for southern Californians. These products were intended for wide distribution, and printed in quantities ranging from several thousands of the magazines and fact sheets to two million copies of the handbook. Many of these products were also adapted to the World Wide Web where they are accessed regularly by Internet users. The USGS participated on the interagency team that developed 1994 post-earthquake updates and new provisions for the California Earthquake Hazards Reduction Program. The update, published separately in 1994, will be fully integrated into the State planning document, California at Risk, in late 1996. California at Risk is a prime example of the link between scientific findings and applying those findings to earthquake hazards reduction throughout California. Throughout the nation, ongoing research by the USGS and other NEHRP agencies continues to improve the understanding and awareness of earthquakes. The advances translate into model policies and other lessons that need to be applied nationwide as other regions at risk develop stronger seismic safety programs. The USGS response to the Northridge earthquake, taken in its entirety from scientific research to policymaking, demonstrates multi-agency cooperation, communication, response, coordination, and relevance. LW9410o: 19200 dpi jpeg from original photograph (35mm BW negative) by Leon Worden.